One can imagine the crinoids growing in extensive marine meadows, rippling in the waves on their long, thin, graceful columns, like garden flowers in the wind. On rare occasions, they were preserved whole, flattened to the bottom by a storm and quickly covered with lime mud. 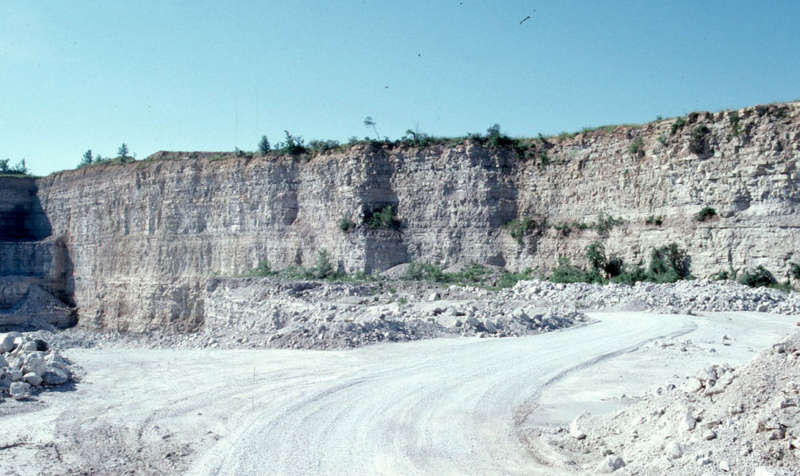 Unfortunately, the organic matter connection the plates and columnals of the stem nearly always rotted in the water and plates were scattered and sorted by the waves to form crinoidal limestones (Clark and Stearn, Geological Evolution of America, 1960). 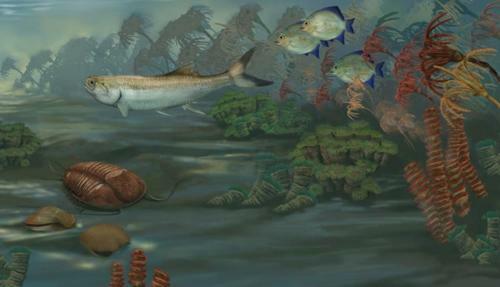 Why crinoids exploded in abundance so long ago is somewhat of a mystery, although a recent study suggests that mass extinctions of fish at the end of the Devonian period (416-359 mya), “the age of fish,” helped give rise to the age of crinoids: what was bad for fish was good for the fish’s food, according to a recent scientific paper. Equally mysterious is why, almost 240 mya they almost completely disappeared, with less than 1% of the species surviving into the Mesozoic. 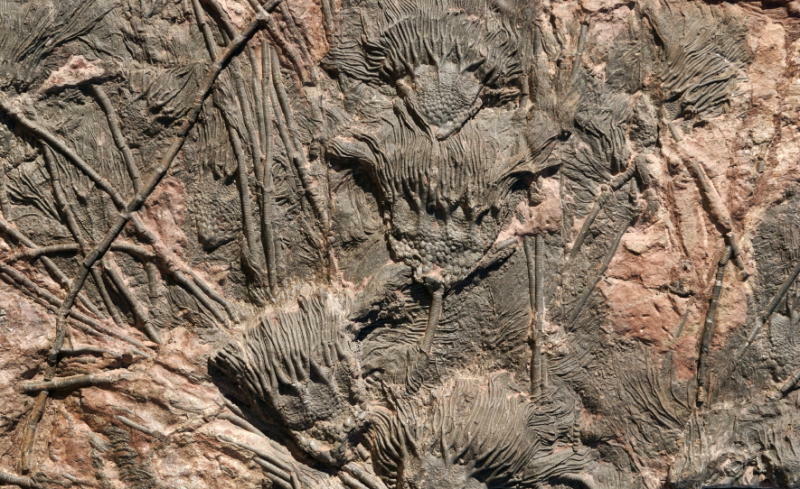 Prior to that time, crinoids were mostly of the stalked variety and attached to the seafloor; after that they were more likely to be unstalked and more motile, possibly a response to the increased abundance of predators in the Triassic. What we have today are remnants of those long ago mass extinctions that have flourished in recent times. 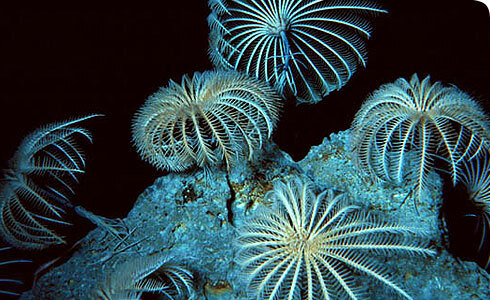 My first encounter with crinoids was while Scuba diving in the Philippines in the 1970s. While moving in close and pondering just what the heck I was looking at, to my delight the critter jumped off the reef and swam away. This is why I love invertebrates! Now while Florometra can move it doesn’t hold any speed records, although it is pretty fast while swimming which is a likely response to predators or perhaps just to relocate to another spot quickly. Using the small cirri at the base of its body it can “walk” across the seafloor and find optimal places to feed and take best advantage of prevailing flow patterns. It feeds by extending its long arms into the water column and filtering out small particulate nutrients with its podia or “tube feet” which are then transported down to the mouth which faces up at the base of the main body or cup. They are obviously very good at what they do as they are very common most everywhere along the US west coast. It a study we conducted at 112 sites off southern California they averaged 2.2 crinoids per square meter of the seafloor; at 22 sites off Oregon, 1.2 per square meter. In some areas they formed a thick carpet over the seafloor where small fish, mostly juvenile rockfish, were seen hiding amongst the crinoid “forest.” Perhaps this is what they looked like in the past, although many of those were much larger and over 6 feet in length. 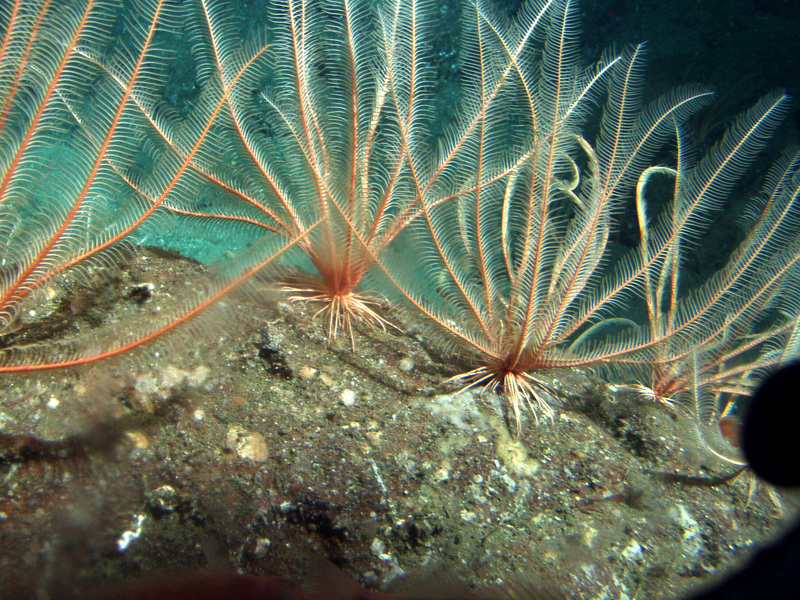 The extent to which crinoids may provide critical habitat for fishes is unknown but they certainly seem to be an important inhabitant of the continental shelves of the west coast. Here’s some video clips of crinoids (mostly Florometra) from MBARI in California to give you an idea of their abundance and sheer beauty. Plus, they can swim! !